You can help out with a basic idea: parking. Policy makers and politicians appreciate that under the strictest development terms, motorcycles are in fact a solution. Jurisdictions around the world prove this every day. Also, motorcycles, as Motorcycles OK advocates, are a solution that integrates with bicycles. Car drivers appreciate not losing parking spaces to motorcycles. Many a temper has been tested as drivers come upon a single motorcycle using a car spot. Given that situation, most drivers would be happy to see motorcycles parking just about anywhere else rather than taking up car spaces. Be happy when motorcycles are filling in the unused spaces at the end of aisles. Planners appreciate the potential for maximizing use of space and enhancing security by parking motorcycles (and bicycles, in some cases) in areas that may not be the best for other cars and light trucks. Riders appreciate footings or anchors to which they can lock their motorcycle onto for extra security. Parking areas close to building entrances are an obvious incentive for using a motorcycle, and adjacent main entries also helps with security. Vancouver has designated end of street motorcycle parking zones that offer a greatly reduced rate. Support motorcycles as a solution. You’re already halfway there by spreading this post. 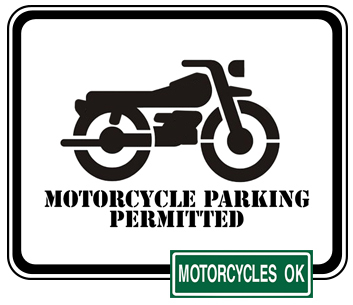 Encourage people to sign up to Motorcycles OK motorcyclesok.ca – it’s free! Ask questions. With a Provincial and Municipal elections on the horizon, you may get the chance to speak with any number of candidates. Ask them their position on congestion and transportation solutions around two-wheeled travellers. If they default to a “let’s make more bike lanes” you’ll know they haven’t thought the issue through. Tell them about Motorcycles OK.